Brilliant, Genius, Firebrand Orator, Legal Legend, Maverick, Philanthropist, Man of Steel – determination and principled convictions, gentle but firm, well-read, . . . . . frankly I simply run out of commendations to describe someone with all these qualities rolled into one. 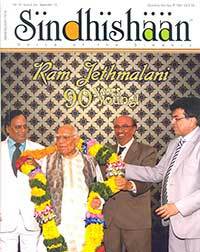 What do you call such a man – we call him RAM JETHMALANI – beloved patriarch of the Sindhi Community who completed 90 active years of his life on 14th September. He often says, he’s now in the Departure Lounge waiting for the final departure call. But I am convinced he’s in the Transit and not the Departure Lounge. His energy, enthusiasm and zest for life will see him criss-cross the globe in and out of several transit lounges with the final departure call still a long way off. It would not be out of place to share an anecdote that amply demonstrates this tremendous endurance and stamina which puts the likes of us, several decades younger, to shame. Sometime back he called me from Delhi – suggesting that we meet over breakfast the next morning to discuss some issues and he was taking a flight to Mumbai that evening. The next morning around 8 a.m. I called his residence to confirm whether he had arrived the previous evening as he’s often known to change plans at the last moment and rush off somewhere else on an urgent call. I was informed by the house help that he had indeed arrived although very late as the flight had been delayed. When I asked whether he has awake and I could have a word with him, the reply I got was “Saab has gone for a game of badminton but will be back by 8:30 a.m.!” Later, over breakfast when I enquired about his plans for the day I was told that after breakfast, he had to meet a client briefly and then was going by road to Pune to be with some of his students from SYMBIOSIS, and then later in the night – fly back to Delhi as he had to appear in court the next day – PHEW! I felt tired just hearing his schedule. His towering personality syncretises divergent beliefs demonstrating unbounded liturgy for this charismatic born leader. Born in Shikarpur (Sindh – Pakistan), he cleared his matriculation at the age of thirteen and acquired his law degree at the age of seventeen. He worked as an advocate in Karachi for six years and migrated to India after partition and as they say . . . . . . the rest is history. Global Sindhi Council celebrated the land-mark event of his 90th birthday which is covered in this issue. Almost 5 decades back Chandru Thakur, after obtaining his Engineering Degree from Baroda University and AMIE certification from Mumbai, exhibited his entrepreneurial zeal by manufacturing the first indigenous MIXER in India under the brand RICO (Rajen Industrial Corporation), Rajen being the name of his eldest son. After adding several appliances to his product range and having successfully established his business he has now delegated responsibility of running his empire to his sons. One would think he would now rest on his laurels and lead a laid back life. But not our friend Chandru. He immersed himself in social service participating actively in the welfare schemes of Chesire Home, Sneh Sadan, Swami Narayan Mandir, Rama Krishna Mission and the like. Not content with social service alone he set on educating himself delving deep into his roots – culture – heritage and cleared his M.A. in Sindhi, first class first, from the University of Mumabi at the age of 82, during the course of which he came close to his professor Dr. Baldev Matlani, under who’s guidance he is now busy preparing for his PhD in Sindhi. Amazing isn’t it? Just goes to show that you are as old or young as you feel and accept yourself to be. Keep your spirit high, interests alive, actively pursue what you didn’t have time for earlier and you can never grow old. 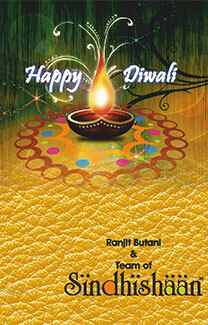 Wishing you dear readers a HAPPY DIWALI! !